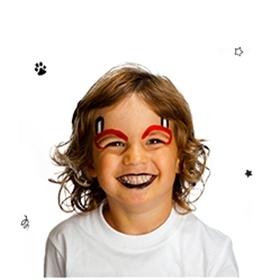 Using a RED face painting stick, draw an exaggerated eyebrow shape over the eyes. "Using a WHITE face painting stick, draw a horn from the top of each eyebrow. Then with a BLACK face painting stick, carefully outline each horn and paint the lips." 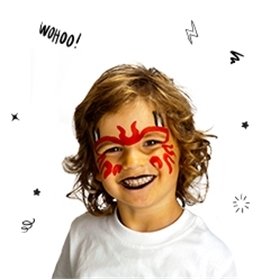 Using a RED face painting stick, drawn on the flame lines on the forehead and cheeks. 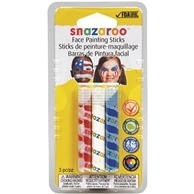 These Unisex Face Painting Sticks are easy to use and very handy. You can take them to any party for instant success.